Flowers and tributes are placed on the Star for Aretha Franklin on the Hollywood Walk of Fame in Hollywood, California, August 16, 2018, after the music icon, legendary singer and “Queen of Soul” loved by millions whose history-making career spanned six decades, died on Thursday, August 16, 2018, her longtime publicist announced. Franklin, who was 76, influenced generations of female singers with unforgettable hits including “Respect” (1967), “Natural Woman” (1968) and “I Say a Little Prayer” (1968). She passed away at home in Detroit from advanced pancreatic cancer. Aretha Franklin, the music icon, legendary singer and “Queen of Soul” loved by millions whose history-making career spanned six decades, died at her Detroit home on Thursday. She was 76. She influenced generations of female singers with unforgettable hits including “Respect” (1967), “Natural Woman” (1968) and “I Say a Little Prayer” (1968). After a long battle with pancreatic cancer, Franklin passed away at 9:50 am (1350 GMT) surrounded by her family and loved ones, her family said in a statement issued by her publicist. “It is with deep and profound sadness that we announce the passing of Aretha Louise Franklin, the Queen of Soul,” the statement said. The family thanked fans around the world for their “incredible outpouring of love” since it first emerged earlier this week that she was gravely ill. 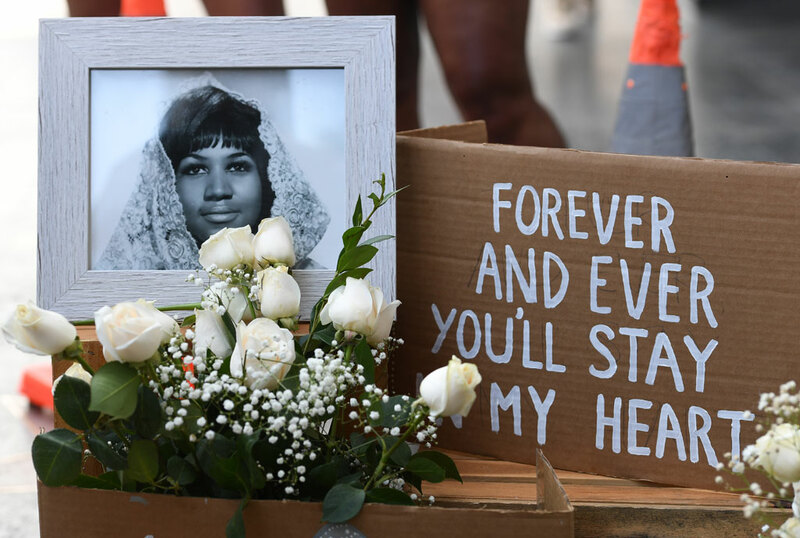 Fans mourning the death of Franklin left balloons, flowers and mementos at Detroit’s New Bethel Baptist Church, where as a child the star kicked off her storied career singing gospel. Reverend Charles Turner described her passing as a “Great loss — can’t nobody replace her,” adding that the grief felt by mourners was akin to the loss of a parent. And in California similar tributes quickly amassed on Franklin’s star on the Hollywood Walk of Fame. The 18-time Grammy award winner inspired multiple singers during her five-decade career, from pop diva Mariah Carey and the late Whitney Houston, to Alicia Keys, Beyonce, Mary J. Blige and the late Amy Winehouse. She performed at the inaugurations of presidents Bill Clinton and Barack Obama, singing “My Country ‘Tis of Thee” at the investiture of the country’s first African-American head of state. 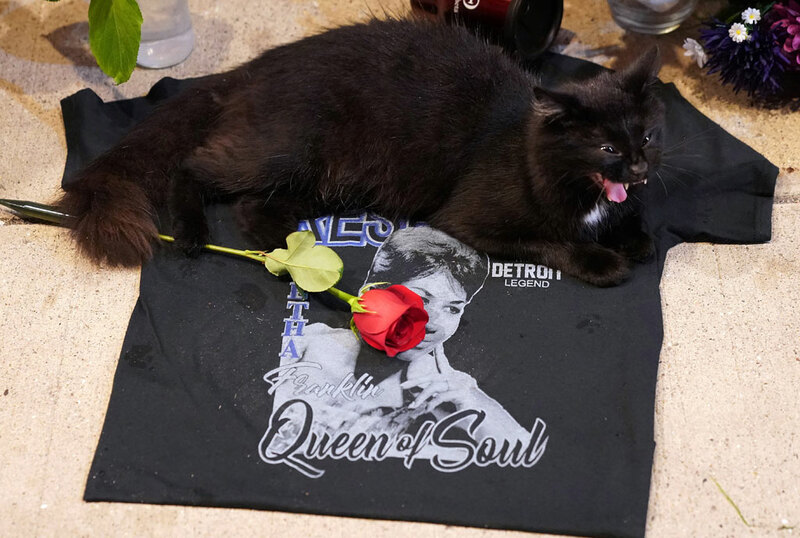 A black cat sits near a rose is placed on a t-shirt at a temporary memorial set up for late singer Aretha Franklin at New Bethel Baptist Church in Detroit, Michigan, on August 16, 2018. Aretha Franklin, the music icon, legendary singer and “Queen of Soul” loved by millions whose history-making career spanned six decades, died on August 16, 2018, her longtime publicist announced. She was 76. Franklin — who was widely known by only her first name, in true diva style — rose from singing gospel in her father’s church to regularly topping rhythm and blues and pop charts in the 1960s and 1970s. Other than “Respect,” her powerful cover of the Otis Redding tune that became a feminist anthem and her calling card, Franklin had dozens of Top 40 singles, according to the Rock and Roll Hall of Fame. Franklin’s declining health was first disclosed on the Showbiz 411 website late Sunday by Roger Friedman, a reporter and family friend. The Detroit News later reported that she was in hospice care, as artists from across the musical spectrum offered well wishes to the singer who lived in Detroit — the Motor City, home of Motown — most of her life.